108 squares for a 31 in. × 40 in lapghan. Once you have made all your squares, it is time to join them. For this afghan I chose a basic no-frills slip stitch join. 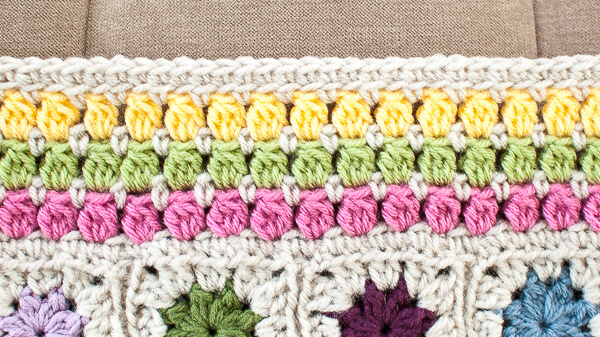 This is a super easy way to join your squares and minimizes lots of tails to weave in. 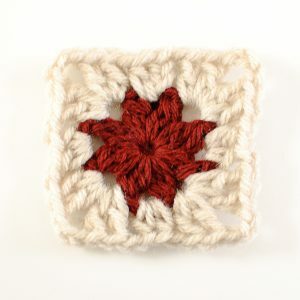 Using the same color you used for the outer round of your Cluster Burst Square, join your squares using my photo tutorial here. For my lapghan, I joined 9 squares per row for 12 rows. 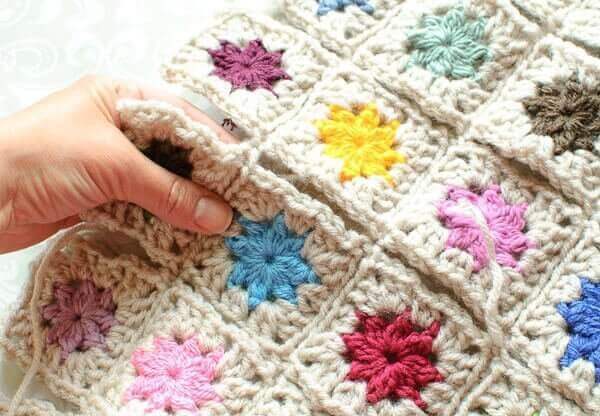 Once you’ve got all your squares joined, it’s time for your border. Here is another fun opportunity for you to play with colors! For these rounds I continued incorporating in my Linen color, but this time added Vanna’s Choice Baby Yarn in Lullaby Pink, Sweet Pea, and Duckie as well. I love, love, love the result. Click here for the written pattern and stitch diagram. Voila! Here is my finished lapghan all ready to keep me cozy while I work. Don’t mind my messy office! I would love to see your finished afghans! 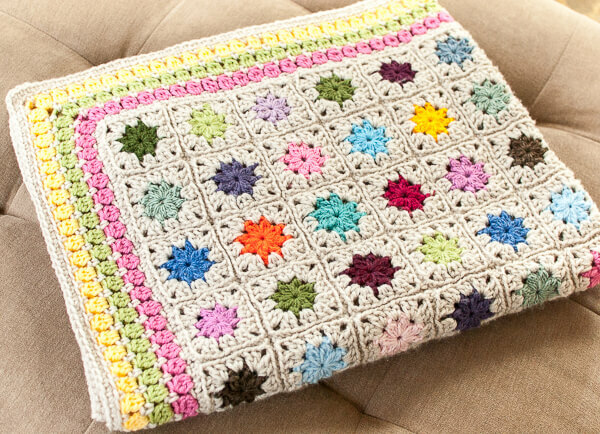 Feel free to share your beautiful afghans on my Facebook page here or tag me on Instagram @petalstopicots. Love the colors and the design. Do you have a written pattern or diagram I can follow? I find it difficult to follow By the photos alone. Hi Monica 🙂 The written instructions appear along with each set of photos. Very pretty! I just made a granny stripe afghan to use up leftover yarn and made quite a dent in my stash. I’d like to try this the next time. Hi are you using U.S. stitches or UK stitches? Thank you ! Very prompt response – I’m used to the US version so will definitely give this a go. I have to give this one a try -soo beautiful!! So lovely it is ! So lovely! I love the colors! I love this afghan. The colours are cheerful and bright. 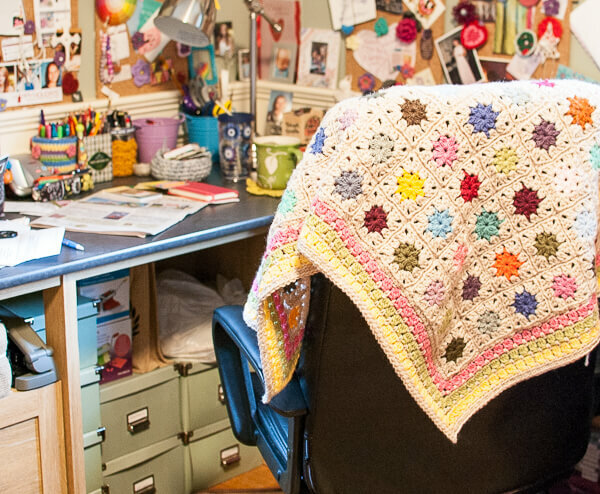 Your office also looks cheerful and bright (not messy) so a perfect choice to keep you warm while you work. The afghan is lovely Kara. I especially love the border! Thanks so much for sharing. I love the beauty in color and pattern. This is one I plan on doing as a gift to my daughter. Thank you for sharing.